The semisweet chocolate morsels in your favorite chocolate chip cookie may be more beneficial than you realize. 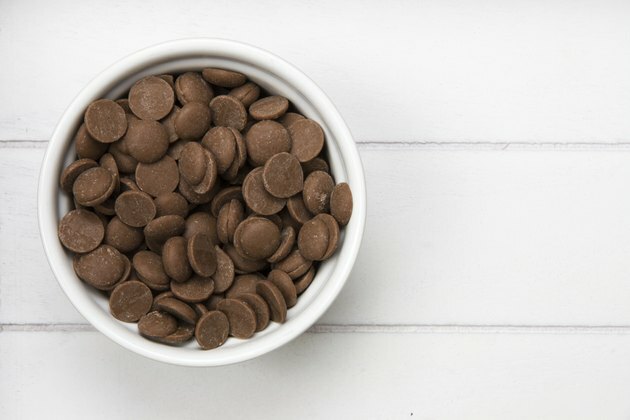 That is not to say that over-indulging in cookies is a healthy habit, but semisweet chocolate chips, also called bittersweet chocolate, do have antioxidants that may promote heart health and a touch of sugar to give you a bit of extra energy. Semisweet, or bittersweet, chocolate chips are a form of dark chocolate. JoyofBaking.com describes dark chocolates, like semisweet chocolate, as any chocolate made without milk solids. Semisweet chips will contain at least 35 percent chocolate liquor. The sugar content of a semisweet chocolate chip will vary from one manufacturer to another, so be sure to check the label. A single 1-tbsp. serving of semisweet chocolate chips contains approximately 70 to 80 calories and 4 g of fat. If you are snacking on these morsels, keep a measuring spoon handy. Just 1/2 cup contains more than 400 calories and 25 g of fat. This could turn a tasty treat into a diet saboteur. It is misleading to think of semisweet chocolate as containing less sugar than milk chocolate. Semisweet chocolate chips contain no milk solids, therefore they contain no lactose, the sugar derived from milk. However, semisweet chocolate morsels do contain sugar. A typical 1-tbsp. serving contains approximately 8 g of sugar. All chocolates, except white chocolate, contain bioflavonoids. Also found in red wine, bioflavonoids possess strong antioxidant benefits and, according to Fit Day, help promote cardiovascular health and may even prevent some cancers. Dark chocolates, like semisweet chocolate, provide the most nutritional benefit. Harvard Health Publications reports that chocolate can improve the flow of blood to the vessels that supply nutrients and oxygen to the heart and brain. Darker chocolates also appear to have the potential to reduce inflammation. It is important to read labels carefully to ensure you are selecting the best quality semisweet or dark chocolates. Sugar content alone is not enough to go on, as all chocolate chips contain sugars. Consumers should look for labeling that sates the percentage of total cacao content in the chocolate. The higher the percentage, the darker the chocolate.